Understanding how paid search marketing works and how it’s different from an organic search is important so that you use both aspects of search engine marketing (SEM) to generate traffic, get qualified leads, and ultimately revenue to your business. Paid search,also known as pay-per-click or PPC, is an internet marketing model in which advertisers pay a certain fee each time one of their ads is clicked. For many businesses, it's a cost-effective way of advertising because you only pay if and when a person clicks on your ad. If you pay $3.50 for a click but it results in a $350 sale, then you've made a good profit, and are happy. "Traditional advertising is often ineffective"
Traditional advertising is often ineffective, compared with getting targeted traffic through paid search. Although it's more targeted than offline advertising, it's also possible to waste money with pay per click, if you fail to think strategically. There's many things to consider when building a successful AdWords campaign: researching and selecting the right keywords that work for your business, organizing the keywords into organized campaigns and groups and setting up landing pages that convert. The very first step in any SEM including paid search is proper keyword research. Find keywords that are relevant to your site and the products or services you promote. Paid search is an excellent method of finding new keywords to use in your inbound marketing campaigns. 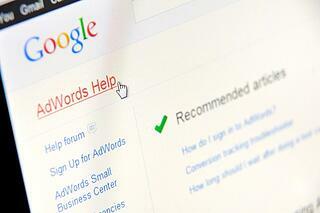 As you build your paid search AdWords campaign, Google AdWords will try to generate a Search Terms report. For instance you have chosen to use "lawn mowers" as your search term, the report will display other relevant keywords like “electric lawn mowers,” “gas-powered lawn mowers,” or “push lawn mowers”. It's very important to review and refine your list of keywords and add new ones. Remember that you're bidding on keywords that “real” people usually search for and their popularity changes over time, so new keywords will always be emerging. Selecting the right keywords will result in higher traffic and improve your paid campaigns and organic efforts. Paid search is also an excellent way of testing and optimizing your landing pages using the A/B testing. You can test new landing pages against your current page by sending 50% of the clicks to your current landing page-A and 50% to a new landing page-B for instance. If landing page B performs better, it then becomes your new control. Test everything. You can try different layouts or test different features on forms. Through the A/B testing, you can find elements that improve the conversion rates; from leads to paying customers. You could also use paid search to boost your visibility in areas and for search terms where you think you've not been successful as you'd like to be. You may rank highly in organic results for a particular keyword but not rank well for other keywords. A well-placed search ad will help increase your visibility and therefore boost your chances to get ranked in organic search results for your other keywords. Paid search is not intended to be a standalone strategy, though it's effective. However, paid search will complement your inbound marketing strategies to generate organic traffic. Why is inbound marketing good for business? Using HubSpot for Inbound Marketing in Australia.